Maybe the best Canadian Rye! I may repeat myself but I am not a rye drinker at first. I would take a Scotch and a Bourbon before a Rye almost every day, but being Canadian and to extend my palate, I go for a Rye from time to time. I read a lot of good things about Wiser's Legacy and it is affordable so I bought a bottle. Previously the best Canadian Rye I had was Lot 40, but I did like it because it was not to me a truly Canadian in its flavor profile. As for the Wiser's Legacy, it has a real Canadian Profile, maple, orange and sweet caramel, of wich I am not usually found of. So what is different with WL: the wood. The nose got maple, orange oil and orange peel, the bitter kind, some white pepper, cinnamon and nutmeg and some floral notes. At the beginning I smell some vanilla and almond with cherries but it recessed with air. On the palate the white pepper is increasing and I have ginger. The wood presence is obvious but balance the sweetness and add a nice floral note with a hint of menthol to give some lightness to this rye. The finish is a swirl of sweetness and bitterness in a good way and is quite long. Conclusion, this is maybe the best Canadian Whisky! But the way the wood is used, I find that there is something American about it. I know, they don't use any Bourbon Cask, but it is at if a master distiller from Kentucky came to Canada to assure the maturation of this Whisky and pick the casks to do so. What ever they did, it is d***** good. J.P Wiser's Legacy The birth of a Canadian whisky enthusiast! Robert, about the wood and American style, I think that there is a lot of new wood aging in Wiser's Legacy, just as there is entirely new wood aging in WhistlePig Rye, which requires it because it is bottled as a US Straight Rye Whiskey. New wood has a whole bunch of rich delicious flavours which are mostly lost once the barrel is used even once. Only a relatively few Canadian whiskies ever use new oak, though more are going that direction, happily. @paddockjudge is extremely knowledgable about the composition and maturation of Wiser's Legacy. Perhaps he will weigh in. @paddockjudge? It is interesting to me that you said that you liked Lot 40 because it doesn't taste to you like a truly Canadian flavour profile...whereas my (one of many) other close Canadian whisky buddies, @Pudge72, says he loves Lot 40 because he considers it the true Canadian rye whisky style. The last time I saw @Pudge72, he brought me a bottle of his preferred Canadian Rye, Lot 40, and he also brought me, compliments of @whiskyjoe, a bottle of my own favourite Canadian rye, Wiser's Legacy. @Victor Thank you for your insight. It makes sens to me that they use new wood but I am guessing Lot 40 also has a lot of new wood just not of the same kind. All the wood spices and the low notes of the Wiser's Legacy are shouting Kentucky to me, when the wood of Lot 40 in the higher notes makes me think of Virgin Oak whisky like Stranahan or Glendronach. It soud strange but the only other rye that I found has as much exotic flavors as Lot 40 is Old Potrero but I will not have to convince you that they are completely different. Finally, I will admit that Lot 40 is showing more and more its origin with air. Yes, the maple is coming back! Luckily for me, there is more caramel than maple. Where to begin? @Victor and @Robert99, coincidentally, today I picked up a bottle of Wiser's Legacy to supplement my cache of eight different batches. I have opened the bottle and poured a good smash of this chewy and delicious triple-grain treat so that I can accurately portray its nuances and complexities. Legacy is not a 'standard' Canadian 'Rye' blend. The proportional composition is somewhat heavily weighted in the rye whisky component of this spectacular blend, approximately 33%, much more than any standard blend I can think of. Barley in the 2 - 5% range and the balance, which is the base, the platform upon which this particular Canadian expression is carried, is a combination of column still and pot distilled corn whisky...and bottled at 90 pf. There is a lot going on with Legacy. Glancing at my collection of notes from a master class, and subsequent discussion, with Dr. Don Livermore, who succeeded David Doyle (2007 Red Letter and the launch of Legacy, 2010) as Master Distiller at Corby's/Wiser's/ Meagher's, this particular expression is a blend derived from varying styles of whisky; pot still rye, malted rye, column and pot still corn and barley whiskies. The rye whisky component is Lot No. 40. The barley whisky is particularly delicious, most notable were the grassy notes that are characteristic of column still production. Believe it or not, the star of the show was the pot double-distilled corn whisky - absolutely incredible, like a long-aged Cameron Bridge single grain Scotch. Dr. Don Livermore indicated the age of the whiskies employed to be 10 years (Red Letter being 13 years, finished in new oak for approximately 5 months and basically column distilled). The new oak used to age all of Legacy's component whiskies is undoubtedly a large part of the unique flavour profile exhibited by this blend; however, the method of distillation is equally influential and makes its mark on Wiser's Legacy. Each of the component parts are truly very fine examples of the various grain varietals, but the method of distillation sets each apart from the other. The floral and fruity aromas from the rye component (Corby's Lot No.40) can be attributed to the copper pot single distillation. The relative absence of any sulphurous, grassy, or soapy notes indicates to me that the proportion of pot distilled whiskies is much greater than that of column distilled whiskies. @Robert, to truly understand WL, one must first understand the component parts. Your comments regarding the wood influence have merit, but do not attribute all of these new properties in this unique Canadian to the wood. You might enjoy knowing that Dr. Don Livermore is one of only two Master Distillers in the world with a Ph.D specific to Brewing and Distilling. Dr. Livermore's Ph.D studies addressed measuring the quality of barrels. WL was launched during the tenure of David Doyle, but there is no doubt Livermore was influential in the creation of Legacy, which was launched shortly before he took the reigns at Wakerville. An exercise I enjoyed very much was blending my own Wiser's Legacy. Under the guidance of the good Doctor, the master class participants were encouraged to use all of the component whiskies to create their own version of Legacy. I've tried this at home many times; it is a lot of fun. I've used Lot No.40 (CC 100% RYE), Deanston's Virgin Oak, and Highwood Ninety 20 years (Century Reserve 21 Years, Century Lot 15/25). Results may vary. I hope this helps in your understanding of Wiser's Legacy, a truly complex and delicious whisky by any standard. Thank you for a very frank and enjoyable review. @paddockjudge, thank you very much for this excellent detailed summary. It is only occasionally that we are treated to this degree of in depth insight about a relatively complex whisky. 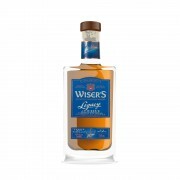 Now when questions about Wiser's Legacy arise, people can be directed to the comment trail of this review for information. It takes a lot of work to put all of this information into succinct relevant form, but, having made that effort, it stands as a record for ongoing reference. Thanks again. @Paddockjudge, I am speechless. Thank you for this very educational comment. I write reviews mainly to force myself in a learning process and hoping smart comments will help me to evolve. And from time to time, I hope others will benefit from those discussions. It is obviously one of those time. I tend to assume that all Canadian Rye have more rye grain than they usually do. With all of your insight, I already understand a bit more WL and I think, I even start to understand the influence of rye on the American Bourbons. But, of course, I have still alot to process! @Robert99, great review, thanks. @paddockjudge, a very helpful comment you've posted there! I'll be revisiting my WL tonight. It's been untouched for about two months, so it's about time to revisit it. I feel much more informed diving back into it after that! @Robert99, there is now a blend from Wiser's that has more than double the 33% pot distilled rye that Wiser's Legacy possesses; it is Dissertation. Where the heck is @hunggar? We miss you.